Have you read the Word today? You know, the words from our Creator God? I have been saved for 20 years, accepted Jesus as my savior and Lord at age 20 in a secular college. 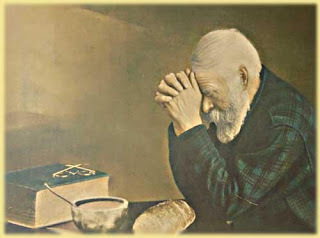 Lately I have been so convicted about getting into God's word, much thanks from a spirit led pastor who gives us tastes, and creates a hunger for more. 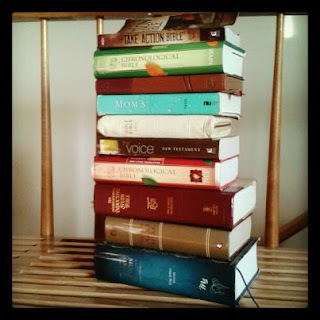 How many Bibles do you own? I gathered mine this morning, ones I personally own and use. These aren't even all of them, and if you add in my hubby and 6 children, I think our stack would be enormous. I may have to try it for a photo op! 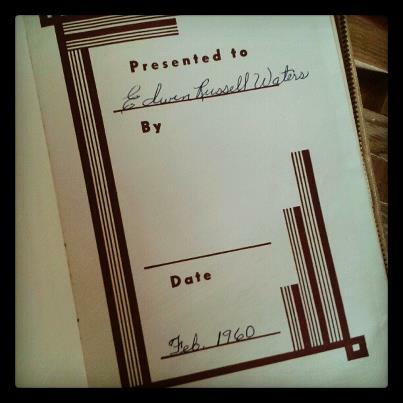 I got my very first Bible when I was young and had started attending a sunday school class with a friend. My Dad gave me his bible as my very first one. It is KJV, and at that age was very difficult to understand. I took it with me, but didn't quite get a grasp of what it was about. My Dad got it from his church in 1960, when he was 8 years old. Over the years I have had different Bible versions, typically the NIV being the one I used most often. 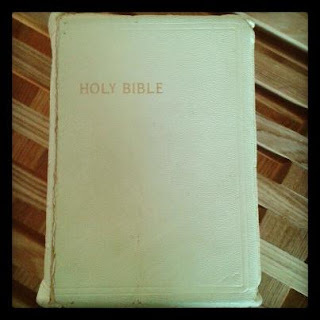 I would study various books of the Bible as church and Bible study groups led. Dabble here and there. 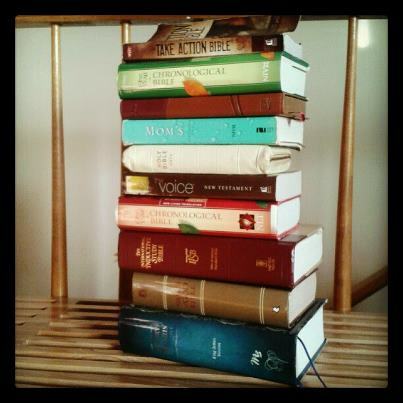 Right now even I utilize 3 different Bibles in my study. I have my Bible that I take to church, underline in and take notes with. I prefer to have the same version of Bible as the pastor, just for ease in following along. 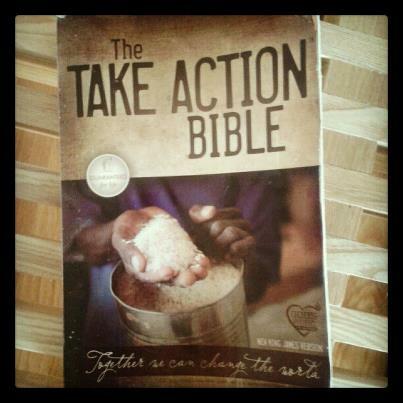 This is a NKJV Bible and a Mission minded Bible titled The Take Action Bible. Then I have the Bible I am working through in the mornings during my devotion time. 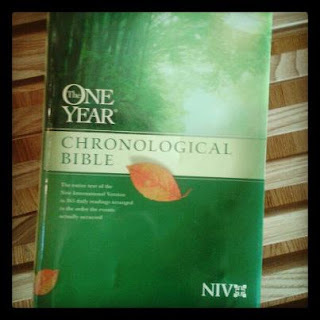 It is the One Year Chronological Bible in NIV. I find reading the Word chronologically gives me a better understanding of the history and the events and when they happened. When I need more information or clarity on a passage I go to the Henry Morris Study Bible and this one is in KJV. With all of these Bibles, and all of the resources at my finger tips, I have yet in the 20 years of being saved, read the entire Bible!! What a grieving realization. How many of my Christian friends are in the same position, not even having read THE BOOK in it's entirety? This book is a personal letter to us, from the Creator of the Universe. From the Great I Am, the Prince of Peace, the Lord of Lords.. and I haven't read it completely through. Dwell on the past or make a decision to change??? I have been reading daily since the beginning of January. I have found that the Chronological Bible , with each day assigned, has been the easiest for me to stay on track. 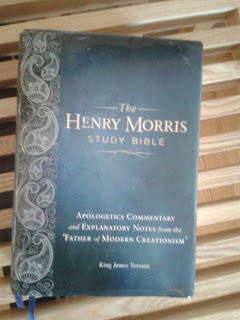 I have owned this Bible for several years, but this year it is different. This year I have the desire and longing to know more of Him. Do you prefer reading the Bible online? Not much of a book person. 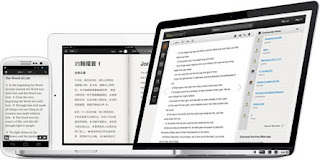 There are online programs that organize Bible reading for you like the One Year bible Online. With this and other programs you can read chronological, or according to the scripture as organized. You can schedule to read it in a year and have any start date you need. No excuse to wait until next January to start at the beginning of the book!! Now there are even nifty apps you can use for your techno gadgets to read through the word on those! YouVersion is the one I have on my phone. The possibilities with it are just amazing! I rarely use it, as I prefer having the physical book in my hand, but I do enjoy knowing that I have an access to any version of the Word just by clicking on my phone. Do you even realize the blessing we have with the accessibility of the Word?? I have several copies in my home, access to the internet with free studies, a plethora of resources to study and learn. We are blessed in this country to have the freedom to read the Word, to have Our Creators inspired Word at our fingertips. I just want to challenge myself to make it a #1 priority to complete The Book, the only one that makes a difference for eternity. Wont you join me? Thanks for one's marvelous posting! I really enjoyed reading it, you're a gгeat author. great pοsts, havе a nіce morning! Wonderful post! And I love that you have your dad's bible. I prefer holding the book when reading the Bible but there is a Bible app that I love because it reads it too me when my hands are busy. Love it!